Yasmine Bleeth is an American actress. She has appeared in a number of TV programs and films. Her most famous role was as Caroline Holden in the TV series Baywatch. A Story of Self-Discovery Rekindled Romance, and True Family Love. 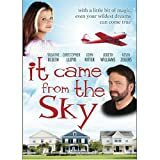 In this emotional and humorous tale, Donald Bridges (John Ritter) and his wife, Alice (JoBeth Williams) are an unhappy couple struggling with a tragic past when a plane mysteriously crash-lands on their roof. From the wreckage emerges an eccentric, wildly romantic couple--Texas millionaire Jarvis Moody (Christopher Lloyd) and his vivacious girlfriend Pepper Upper (Yasmine Bleeth)--who help the Bridges rediscover love and break through to their ten-year-old son, Andy, a brain-injured teen struggling for independence. It Came from the Sky is a quirky and poignant journey of self discovery, rekindled romance, and true family love.